MANILA, -- Both the Philippines and Malaysia on Wednesday expressed their commitment to promote peace, security and stability, maritime security, unimpeded trade and freedom of navigation and overflight in the South China Sea. This was highlighted during the bilateral meeting held by Defense Secretary Voltaire Gazmin and Minister of Defense of Malaysia, YB Dato Seri Hishammuddin Tun Hussein. Hishammuddin arrived in the Philippines last March 10 for a two-day visit which ended Wednesday. Both leaders exchanged views on regional and global security challenges and committed to strengthen defense cooperation between the Philippines and Malaysia. They underscored that disputes in the South China Sea should be resolved peacefully in accordance with international law, including the 1982 United Nations Convention on the Law of the Sea. In addition, both expressed serious concern over the violent and terrorist acts by self-declared Islamic State and other extremist organizations in Iraq and Syria. They likewise decided to strengthen mutually beneficial efforts to enhance disaster risk reduction and disaster response. On multilateral cooperation, they welcomed the significant progress of the ASEAN Defense Ministers’ Meeting (ADMM) and ADMM-Plus and pledged deeper practical cooperation under these regional platforms. 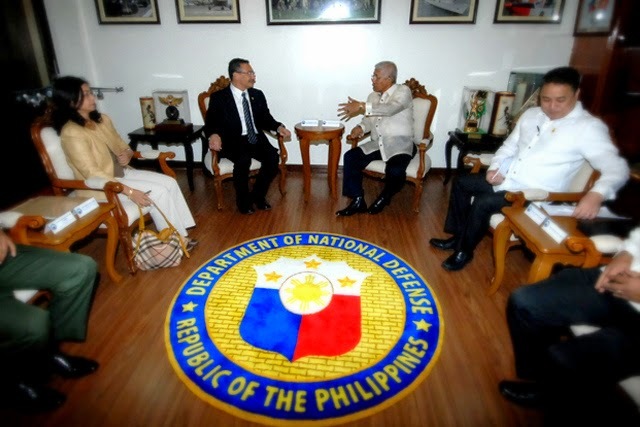 The two also lauded the achievements of the Armed Forces of the Philippines and the Malaysian Armed Forces in deepening and widening military cooperation through visits of high-ranking officers, military education and capacity building, training and exercises, exchange of personnel and exchange of information. Acknowledging that military ties is the foundation of defense relationship, the two Ministers encouraged their respective militaries to pursue additional opportunities for engagement in the areas of HADR, peacekeeping, maritime security and military medicine, among others. Moreover, they stated their intention to promote defense industry cooperation by encouraging industrial cooperation and facilitating the development of technology, commercial and economic links between defense related companies of the two countries. Finally, in recognition of their common interests, Gazmin and Hishammuddin reaffirmed their resolve to heighten the level of defense cooperation in order to promote mutual understanding and trust and contribute to regional peace and stability. Defense Minister of Malaysia Dato’ Seri Hishammuddin Tun Hussein and Secretary of National Defense Voltaire Gazmin hold a bilateral meeting on Mar. 10, 2015.